Yes, it’s scary when most of the components of your favourite treats seem to begin with the letter ‘E’, but the ingredients list should be your first port of call. Ingredients are listed in order of weight, so, if one of the top three is ‘sugar’ or ‘hydrogenated vegetable oil’, beware. Added sugar can trigger blood sugar spikes and lead to weight gain – keep an eye out for all kinds of syrups, honey, nectar, molasses and anything ending in -ose (e.g. fructose, glucose, dextrose, maltose). 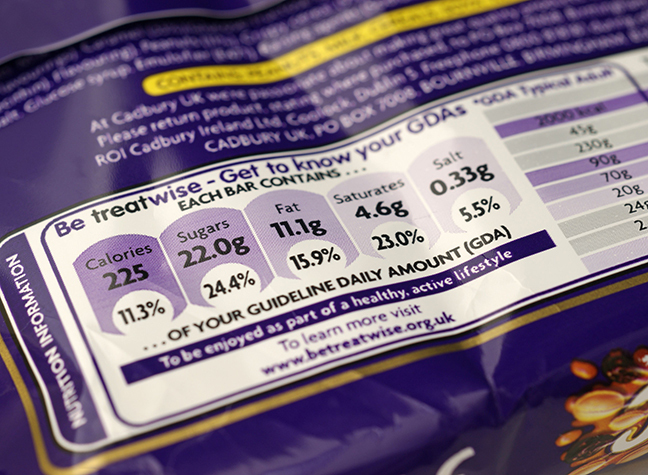 Sugar is often added to foods labelled ‘low fat’, ‘fat free’ or ‘diet’ to boost flavour. You should also watch out for artificial sweeteners such as aspartame, saccharin and sucralose, which have been linked to weight gain and health problems. Hydrogenated oils are vegetable oils which have been converted into ‘trans fats’ as a result of chemical processing. Research (controlling for calorie consumption) has linked trans fat intake to weight gain and abdominal fat storage, as well as to health conditions such as heart disease. Seek out products made up of unprocessed, ‘real food’ ingredients as far as possible. As a rule of thumb, the shorter the list, the better! Look for cereals, rice, pasta, bread and wheat products made from oats, whole grains, wholemeal or whole wheat flour (not simply ‘wheat flour’). However, beware of the ‘natural flavourings’ catch-all. This can conceal hidden nasties like MSG (monosodium glutamate), which has been linked to obesity. That cheese-packed, carb-heavy ready meal may ‘only’ have 378 calories per serving… but take a closer look at the small print: the serving size is half a pack. Oh. Food manufacturers’ ideas of serving sizes (2 squares of chocolate) very often differ from ours (the entire bar). If you are going to eat the entire bar, and the entire bar contains 10 squares, you’ll need to multiply the values on the label by 5 (sorry, them’s the rules). Those blasted traffic light labels, taking all the fun out of your favourite foods, eh? Well, they do provide a useful ‘at-a-glance’ guide, but don’t worry: a few reds and ambers here and there aren’t necessarily going to derail your diet. 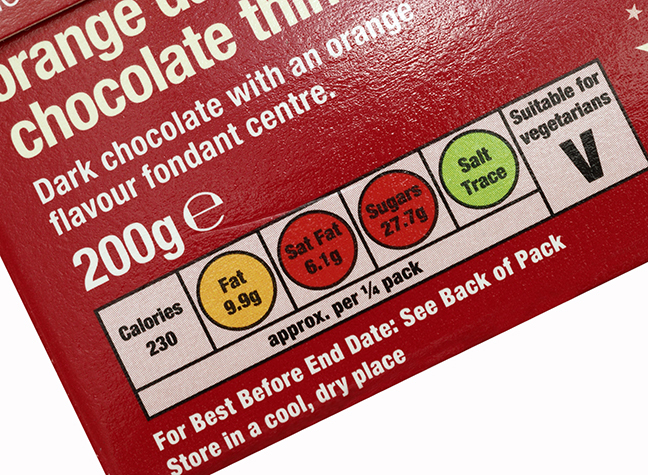 Values are typically given for the levels of fat, saturated fat, sugars and salt contained in a product: green means low, amber means medium and red means high. Products with more greens and fewer reds tend to be better choices, but, if you generally eat a healthy diet, ambers are nothing to worry about, and the odd red isn’t necessary a cause for concern – many healthy foods are naturally high in one element e.g. fruit is naturally high in sugars. So stop, look and listen, then proceed – with caution. More calorie-dense foods are lower in calories, gram for gram, and tend to keep you feeling fuller for longer. If you are comparing two options, don’t automatically pick the one with fewer calories per serving – see how they compare per 100g, too. Time to take a closer look at the back of the pack. According to UK government guidelines, a high fat food contains more than 17.5g fat per 100g, whilst a low fat food has less than 3g fat per 100g. 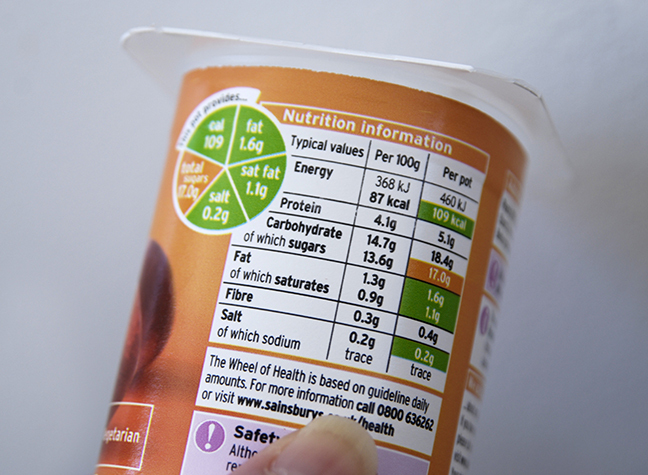 A product containing more than 5g saturated fat per 100g is considered high in saturated fat, whilst less than 1.5g is considered low. 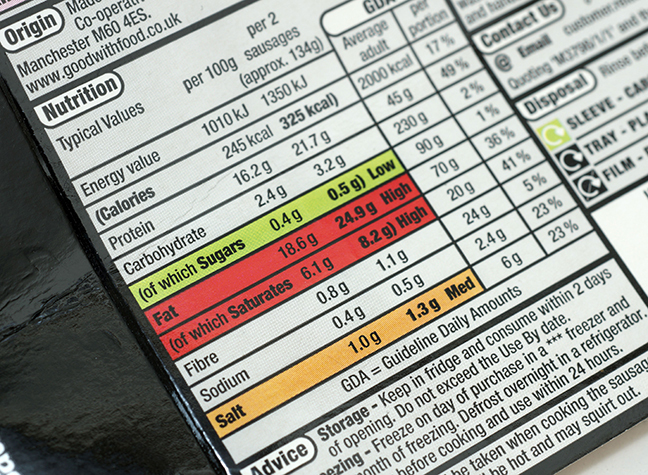 Nutrition labels usually tell you what proportion of your daily reference intake of total fats and saturated fats a product provides. Fats provide essential nutrients, and a high-fat diet won’t necessarily impede weight loss. In fact, the saturated fats in coconut oil have been linked to a reduction in belly fat. However, if the fat in your food is largely made up of hydrogenated oils (aka trans fat), you should be cautious of high values here. A high sugar food contains more than 22.5g sugar per 100g, whilst a low sugar food contains less than 5g per 100g. Eating too much sugar may cause blood pressure spikes which trigger cravings and encourage the body to store excess calories as fat, so it pays to watch your intake carefully. Nutritionists recommend you opt for breads and cereals containing no more than 10g sugar per 100g. Cereals containing dried fruit should contain no more than 20g sugar per 100g. The NHS recommends limiting added sugars (including honey) to 30g a day, or no more than 5% of your daily calorie intake. However, you may safely consume some additional sugar in the form of fruit, according to most nutritionists (but not fruit juice, which should be limited to 150ml per day). Although an energy bar made from ‘raw’ fruit and nuts may contain more sugar than a chocolate bar, for example, most nutritionists would advise you to pick the former – you should still try to treat it as a ‘treat’, though! A high-sodium diet can encourage water retention and bloating, so keeping your intake down could help you squeeze into those skinny jeans. A high salt food contains more than 1.5g salt per 100g, whilst a low salt food contains less than 0.3g salt per 100g. Fibre helps to fill you up, slow sugar release and curb cravings. In one study, people who consumed an additional 14g fibre at least 2 days a week lost an additional 1lb over the course of a month. Experts recommend choosing breads, cereals and snacks containing at least 3-5g fibre per serving. A simple calculation could tell you how healthy your choice of meal or snack is, according to celebrity nutritionist Dr Charles Passler. It all comes down to the balance between carbohydrates, fibre and protein. Protein-rich foods reduce appetite, heighten our sense of satiety, boost metabolic rate and curb carbohydrate-induced spikes in blood sugar. When choosing a meal or snack, you should aim for at least 1 part protein to 2 parts carbs (minus fibre). The lower the number the better – aim for 2 or less.